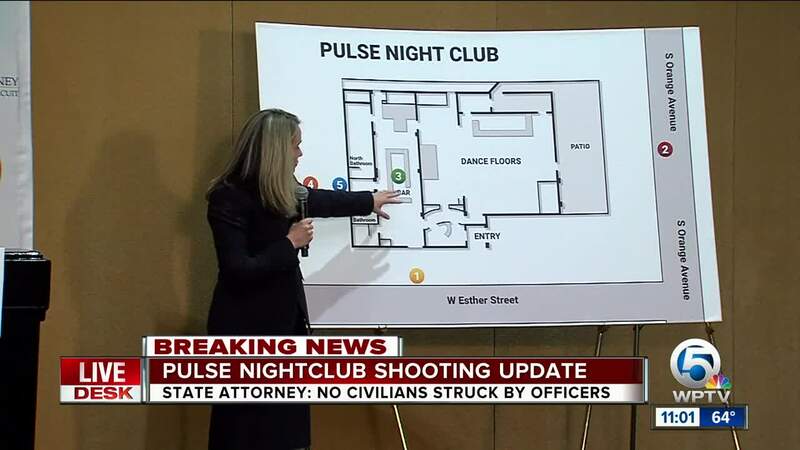 The State Attorney who represents Orange and Osceola Counties held a news conference Wednesday about the Pulse Nightclub shooting in 2016. ORLANDO, Florida — More than 180 times, law enforcement officers fired shots at a gunman who killed 49 people inside Pulse Nightclub. The state attorney who represents Orange and Osceola counties in Florida conducted a news conference Wednesday about the shooting in 2016. State Attorney Aramis D. Ayala said law enforcement officers fired those 180 shots at Omar Mateen, but struck no civilians. In total, more than 400 shots combined were fired by law enforcement and Mateen. The FBI said Mateen opened fire at the nightclub on June 12, 2016, killing 49 people and injuring more than 50 others. Following a six-month review of evidence, the State Attorney's Office said Wednesday that 14 law enforcement officers fired their weapons in five different engagements with Mateen. He was eventually killed by police. 11 of the officers were with the Orlando Police Department, and three were with the Orange County Sheriff's Office. All of them have received clearance letters from State Attorney Ayala. "As our city grieves the senseless tragedy of the Pulse nightclub shooting, I hope sharing the results of this investigation help the survivors and loved ones find some closure," Ayala said. Mateen's widow, Noor Salman, was acquitted in March of last year on charges of lying to the FBI and helping her husband plan the attack.